The new Nook from Barnes & Noble is lighter than a Kindle, simpler than a Kindle, and at $139 it's competitively priced with the Kindle. But can it unseat Amazon's Kindle at the top of the e-book reader heap? It stands a chance a doing just that--once it becomes available June 10. The new Nook will replace the current Wi-Fi-only and 3G Nook models, and will co-exist with the Nook Color Reader's Tablet. In demonstrations at a press event, I had the chance to take the new Nook for a spin. 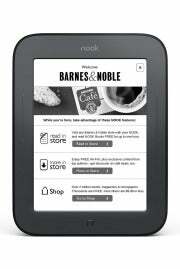 From what I could see, the Nook's tag line, "The Simple Touch Reader" appears fitting. The new design Barnes & Noble CEO William Lynch said the new Nook was designed to appeal to non-techies. "You just push the Nook button and get right into the device," said Lynch. The clean design has a single button at the bottom of the screen and paging and scrolling buttons along the sides, practically hidden from looking like they're buttons. The Nook has significantly less clutter than the 38-button Kindle. The Kindle has a full QWERTY keyboard beneath its display; the Nook relies on a touch screen keyboard. Touch is the biggest news here: Instead of relying on those buttons, you can navigate using the infrared touch screen instead. In the demos, the display appeared responsive to the touch and scrolled smoothly. It actually seemed to excel on its touch responsiveness, with little perceptible lag between commands. Swipes and pokes got quick responses and page turns were smooth and easy on the eyes. Touching and holding a finger on a word brings up a menu of choices, including direct access to Merriam-Webster's Collegiate dictionary. Touching a spot on the screen and dragging your finger up or down highlights a section of text, which can then be shared on social networking sites such as Facebook and Twitter; the social networking features use Nook Friends, a component already found on Nook Color. This feature, when demonstrated, worked fairly quickly. Meanwhile, the six-inch screen was easy to read, and pages turns were fast. The company claims that the Nook suffers from 80 percent less "flashing" between page turns than other e-book readers and at first blush, the unit seems to live up to that claim. I found the E Ink Pearl display comparable to other E Ink displays I've seen; contrast seemed very good, too, which is one of the benefits to the Pearl display (which first appeared last summer on the third-generation Amazon Kindle). The Nook's size is more compact and easier to handle one-handed than before. It's an inch smaller in height, and is extremely light at just 7.5 ounces, or 0.47 pounds--that's 35 percent lighter than its predecessor, and one ounce (or 0.06 pounds) lighter than the Amazon Kindle. The back has a soft-feel rubber texture, which makes the e-reader sit confidently and securely in hand. The e-reader runs Android 2.1, which of course, is more often found in color screen tablets and smartphones. The use of Android 2.1 also bodes well for the Nook, which could potentially gain thousands of ported apps. The unit supports seven font sizes and six font styles. In addition to direct downloads from the Nook e-bookstore, the unit supports ePub and PDF files imported from elsewhere. Lynch noted that the Nook achieves its stellar two months between charges due to the combination of the unit's low-power six-inch E Ink display and the new e-reader's proprietary battery management technology. With the integration of touch, the Nook now has an edge over its arch-rival, the Amazon Kindle. The touch screen is a major boost--it's an interface that appeals to users used to their touch screen cell phones. On balance the Nook promises to be a solid Kindle competitor if not a Kindle killer. With a snappy touch screen, a simple interface, access to huge e-book libraries and a vest-pocket-size, lightweight design that's easy to hold, the new Nook hits the ground running.